In today's hostile computing environment, it is vital that you keep your computer free of viruses, spyware, and malware. Reliance upon the leading antivirus / antispyware suites is not only counter-productive, it is RISKY! Consider this: a successful cyber criminal always "cases" out the environment they want to victimize before they launch their attack. They use forensic tools to determine your operating system, web browser history, plugin libraries, and any antivirus programs you have installed (if any). Once they are armed with this information, they can take advantage of freely available tools to trick you into what is known as a "drive by infection." 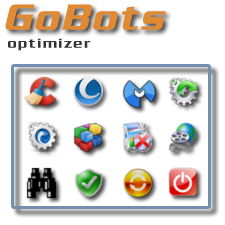 In addition to cleaning utilities, Gobots Optimizer also includes the award winning Advanced System Optimizer, which offers a interview based system analysis and reconfiguration for faster performance. Other utilities such as Startup Master help improve boot speed by eliminating unwanted startup programs.